In Austria the Tux glacier, one of the handful that endeavours to open year round, is one of the beneficiaries, with its snow depth topped back up to 55cm (just under 2 feet) after a long summer melt. There are 9 lifts operating there serving 15km (9 miles) of open piste. Fresh snow on the Kitzsteinhorn glacier above Kaprun means that it will re-open on Friday (September 18) with a 70cm (2.23 foot) base after having been closed for the past month or so due to the hot weather. A third Austrian choice, the Molltal glacier near Mallnitz is reporting the country's biggest snow depth at present with 90cm (3 feet) of snow to enjoy. The Pitztal glacier is also opening for its long 2009-10 season this week, helped by a new plus-temperatures operational snowmaking system imported from Israel and the fresh snow. Solden, which had hoped to open on 5th September but has had to delay opening due to the weather conditions is now reviewing their planned opening after reporting another 8cm (3 inches) of snow today. There was also snow at the four other glacier ski areas currently open in the Alps. Saas Fee in Switzerland reported on www.skiinfo.com another 6cm (2.5 inches) of powder on Tuesday, taking its 7 day total to 10cm (4 inches) and glacier based depth to 65cm (over 2 feet). Its neighbour Zermatt, open 365 days a year for snow sports, has been similarly blessed. There's no outdoor skiing currently available in France, but the fresh snow is good news for Tignes which will re-open a week on Saturday (September 26th) for its long winter 2009-10, just four weeks after closing its summer ski season. 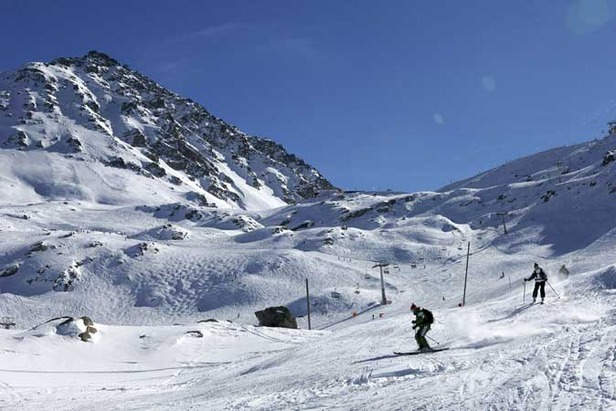 In Italy Passo Tonale and Val Senales are both open for glacier skiing and again benefited from the fresh snow.